Whether you work at a fine dining establishment or a hip and trendy diner, chances are, you’re going to be on your feet for most of the work day. 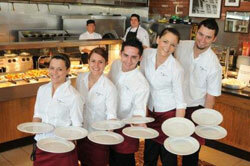 Restaurant environments are fast-paced, requiring everyone from cooks to servers to be quick at their feet at all times. Because of this, restaurant workers need to find a quality pair of shoes that are both comfortable and appropriate for the job. One of the most important things to look for when finding a pair of work shoes is slip-resistance. Restaurants can be riddled with hazards. Simple spills are an injury waiting to happen for those that are not prepared. 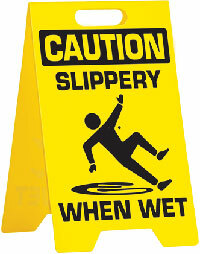 Slip-resistant shoes ensure that you won’t fall if you walk over a wet surface. 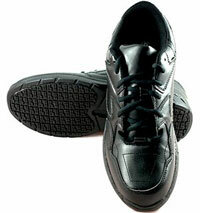 In fact, many restaurant owners require these types of shoes to keep the workplace safe. These shoes feature a rubber sole that will hold onto slippery surfaces. They’ll have treads on the sole, like a car tire, to keep you grounded. Another thing to look for in work shoes is comfort. If you’re on your feet all day, comfortable insoles and adequate padding will be a lifesaver. Extra cushion will offer some added support on your feet and reduce the strain on your legs. On top of that, proper ventilation and an antibacterial lining will ensure that your feet don’t smell after a hard day of work. If you’re on the lookout for some high-quality slip-resistant shoes, look no further. These choices offer all the safety you’ll need to navigate the tables and kitchen with ease. These shoes from MOZO are a stylish, yet effective option. The sole is made from rubber and features a zigzag spider design for improved grip and traction. It is a slip-on shoe, making it incredibly comfortable and easy to put on. The upper portion of the shoe is made from a synthetic leather. While they are slip-resistant shoes, MOZO certainly did not skimp on style. It is sleek and simple, featuring side vents for extra flair and comfort. Inside the shoe, gel cushions keep your feet feeling great. The insoles are also removable, allowing you to keep the shoes clean and in great condition. If a sneaker design is more your style, these slip-resistant shoes from Townforst are a great way to go. Clad in all black, the shoes have a lace up design to ensure that their fit is perfect for all day wear. Cushions and insoles in the middle of the arch will support your foot throughout the day. Special attention was paid to the slip-resistance of these shoes. The sole is made of a rubber compound and was carefully designed to grip onto many different types of surfaces. It has a micro tread design that holds onto the floor on a microscopic level. They also underwent rigorous testing to ensure that they are effective. Another great choice from Townforst, the Frank slip-resistant shoes offer a high level of safety and comfort. Like the previous Eamon shoes, these shoes feature a specially designed tread design that channels away from the bottom of the foot. This improves traction on a number of different surfaces and conditions, including wet and greasy. Comfort wise, the Frank non-slip shoes from Townforst have more than enough padding and support to keep you comfortable all day long. The great thing about these shoes is their overall design. The upper portion of the shoe is clad in leather and features a robust stitch pattern for both style and durability. With a lace up closure and comfortable tongue, these work shoes can easily transition to everyday shoes when your shift is over. From one of the most renowned sneaker manufacturers in the world comes the Rockland Systemic slip-resistant shoes. These shoes are perfect for restaurant workers due to their great comfort and traction. Unlike other shoes that have a prominent tread, the rubber soles on these shoes have a low profile. However, their low profile doesn’t mean that they are ineffective. In fact, the unique tread design will provide traction on a number of different slippery surfaces. The sole also has extra grips on the perimeter of the sole and up the heel, ensuring that you’re protected all around. As for comfort, the Rockland Systemic shoes have a contoured insole and thick cushion for a great fit. The insoles are also easy to remove for cleaning and maintenance. The Rockland-Hooper slip-resistant shoes from Skechers mean business. They were meticulously designed for durability and safety. Even the smallest details are taken care of to ensure that these shoes are safe to use in a number of different work environments. In fact, these shoes meet the non-slip safety requirements set by the Occupational Safety and Health Administration. They are also approved by the ASTM for electrical safety thanks to the rubber sole. The treads on these shoes are designed to hold up against spills and feature additional grips along the sides and heel. Inside the shoe has an insole made of memory foam to aid with fit and comfort. Outside, the shoe is made from a rugged leather. The leather is reinforced with thick stitching, assuring that they’ll last for many years to come. The Jungle Moc Pro Grip shoes from Merrell are a high-quality option suited for any man working in a restaurant environment. One of the biggest features of these shoes is the inside. The lining of the shoe is made from a breathable mesh for comfort. The heel also has an air cushion that absorbs shock. This reduces the impact on your heel to eliminate discomfort at the end of a work day. It also improves stability. The entire inside of the shoe, from the lining to the footbed, is treated to fight off bacteria and odor. The outside of the shoe is made from nubuck leather. The sole has a specially designed tread that channels water or liquid away to improve grip and prevent slipping. If you want a shoe that looks great, go with the safeTstep Men’s Expo Runner. These shoes look like normal shoes, with a bit of extra style and flair that makes them a unique choice outside of the workplace. The outside of the shoe features synthetic and fabric materials. It also has a breathable mesh that looks great while improving ventilation. While they may look like a normal pair of shoes, they feature a slip and oil resistant outsole. The tread is non-marking, ensuring that you can move swiftly throughout the restaurant without leaving scuff marks wherever you go. Inside, the shoe has a 24/7 comfort insole. These insoles have superior cushion and padding for both support and comfort. These slip-resistant shoes from Annte are simple and discreet in design, yet pack in a lot of features for safety and durability. The slip-resistant sole has a unique design that doesn’t hold in liquid or water. Because it doesn’t hold anything, the shoes are safe to use on a variety of surfaces and conditions while being simple to clean and maintain. The insoles used in these shoes are comfortable, but made for durability. They are designed to withstand heavy wear and tear. The slip-on design is made of genuine leather for durability. The glue formulation used to hold the shoe together is high caliber, ensuring that the shoe will last through many hectic shifts. These shoes from Dockers are a high-class option fit for fine dining establishments or a night out. 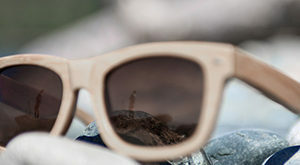 They are made from high-quality materials for aesthetics and durability. They have a slip-on loafer design. The upper portion is made from leather that is treated to resist water and stains, ensuring that the shoes maintain their high-class look. The lining and insole are made from soft fabrics. The insole has adequate cushioning while the heel features gel for comfort. Safety wise, these shoes are safe to use on a variety of surfaces. While it does feature a 1-inch heel, the entire sole is covered in a unique tread that improves traction. Overall, the shoe is a safe choice for restaurant environments while maintaining a fashionable appearance. The Synergy-Tal slip-resistant shoes from Skechers are a superior, yet affordable choice. They look very similar to high-quality sneakers in appearance. However, the shoes have a number of safety and comfort features designed to make work life easier. Inside, the shoes have more than enough padding. The padding extends up to the tongue of the shoe to provide a customized fit. The insoles are made from memory foam for a personalized fit while the midsoles have a shock-absorbing cushion to reduce fatigue. The sole itself looks like a car tire. The treads are specially designed to channel water away, making them very slip-resistant. The outside of the shoes are also cleverly designed for durability and style. Available in all black or black with lime accents, these shoes can work well in your personal collection. All in all, there are a number of great options when it comes to slip-resistant shoes. Guys can choose a pair of shoes based on the restaurant they are working at, their own personal style, and their comfort needs. If you’re having trouble choosing a pair, it’s best to go with an all-purpose slip-resistant shoe. These shoes are designed to work best in all environments, from the back kitchen to the front of the house. They will have all of the great slip-resistant features and some added durability, stain-resistant, comfort, and cleaning features. When it comes to working at a restaurant, slip-resistant shoes are a must have. They’ll keep you safe from spills while looking great in the process. At the end of the day, your feet and legs will thank you. The shoes will keep you grounded and comfortable while you speed around the restaurant in style.